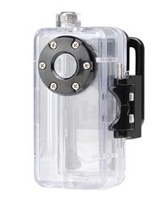 The Zetronix zWC-MicroDV Waterproof Case is designed for use with the Zetronix zMicro-DV camcorder. The case allows you to capture unique marine video footage down to 99 ft. (30m). The hard plastic housing protects your camcorder when you’re taking part in water sports or in bad weather. It’s also perfect for protecting your camcorder at the beach and in other harsh environments. The case can access most of the camcorder&#39s controls. The housing is so small and light that it can be used for other sports including skiing, boating, kayaking, and canoeing. It also works in less-than-ideal weather conditions. Hard plastic housing shields this camcorder from sand, rain, and snow. Offers waterproof protection down to 99&#39 (30m) deep. Convenient strap for carrying while swimming and diving.